K-State western rider Kara Guy brings Whiz to a sliding stop as part of the reining portion of the competition in the meet against Oklahoma State on Saturday, November 8, 2014 at Timbercreek Stables in Manhattan. K-State defeated Oklahoma State 12-7. A weekend trip to the state of Texas brought K-State equestrian their first road competition of the season. However, the step away from their home of Timbercreek Stables proved to be a costly one. 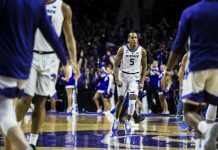 The Wildcats suffered back-to-back losses to TCU and Baylor and now sit at 4-2 on the season. They’ll look to rebound with a trip to Fresno, California to face Fresno State and Auburn on Friday and Saturday. 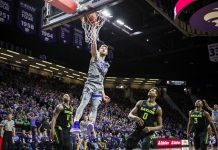 A trip to Fort Worth, Texas on Friday was up first for the Wildcats, but they fell 13-5 to the Horned Frogs. 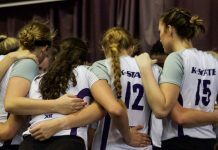 Of the five points that K-State scored, team captains Madison Wayda, Savannah Smith and Danielle Kemper scored three of them. In Equitation Over Fences, K-State fell 4-1. Their only loss in Equitation on the Flat this season came with a 3-1 score. K-State’s point was won by sophomore Christina Martinelli. In Horsemanship, the Wildcats tied 2-2 with the Horned Frogs. In Reining, K-State dropped its third category of the day with a 4-1 score. However, Smith’s point gave her a 4-1 record this season. On Saturday, the Wildcats traveled south to Waco, Texas to take on No. 1 Baylor. The road once again brought K-State trouble as it dropped a 13-7 decision to the Bears. Despite the loss, Maxwell said she believes it was an improvement to the meet at TCU. In Equestrian Over Fences, Baylor won 3-2. The points were scored by sophomore Taylor Schmidt and Wayda, who earned her 10th win with the finish. However, K-State held the edge in Equitation on the Flat with a 3-2 victory. This was returning to the theme of the rest of the season, showing its loss in Equitation on the Flat to TCU to be a rarity. The Wildcats then lost in both Horsemanship and Reining, settling with a score of 4-1. The single point in Horsemanship was won by senior Kelsey Sousa. 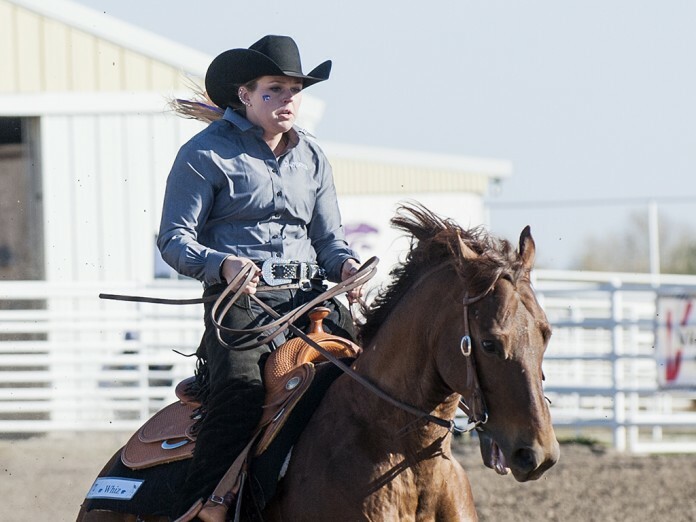 The single point in Reining was won by junior Nicholle Hatton.